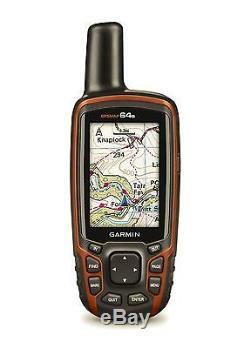 U n b e a t a b l e o f f e r. This listing is for a brand new Garmin GPSMAP 64S!!! With 3-axis tilt compensated compass and barometric altimeter!! 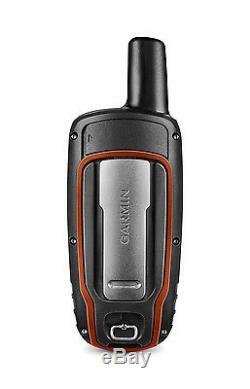 Please visit Garmin or Garmin enthusiasts websites if you need more info. And if paid by direct deposit, we will upgrade it to Express! This is NOT refurbished unit! This is genuine Garmin product. Please do not ask about refurbished units, as we do not have any. 2.4" x 6.3" x 1.4 (6.1 x 16.0 x 3.6 cm). 1.43" x 2.15" (3.6 x 5.5 cm); 2.6 diag (6.6 cm). Transflective, 65-K color TFT, transflective. 8.1 oz (230 g) with batteries. 2 AA batteries (not included); NiMH or Lithium recommended. High-speed USB and NMEA 0183 compatible. Unit-to-unit transfer (shares data wirelessly with similar units). Custom POIs (ability to add additional points of interest). 10,000 points, 200 saved tracks. Automatic routing (turn by turn routing on roads). Yes (with optional mapping for detailed roads). Garmin Connect compatible (online community where you analyze, categorize and share data). Live Tracking: yes (with Garmin Connect Mobile). Garmin GPSMAP 64S Handheld GPS" is in sale since Tuesday, September 13, 2016. This item is in the category "Electronics\GPS". The seller is "watch_maestro" and is located in Waterloo, NSW. This item can be shipped worldwide.